There is no season when you don't need a lip balm. Recently I got Island Kiss Puerto Berry Blush in my May My Envy Box and it looked really exciting, isn't the packaging super cool. 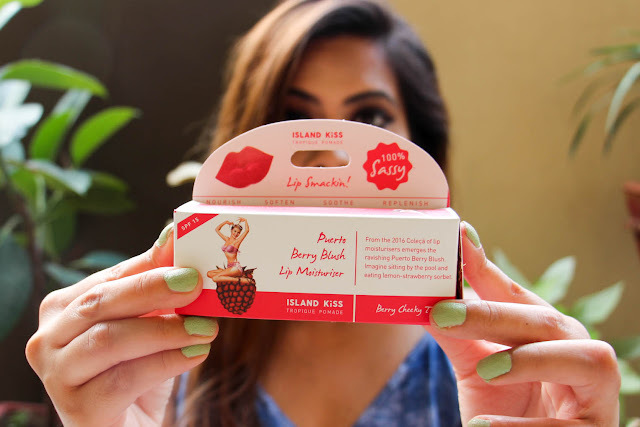 Island Kiss Puerto Berry Blush costs 499 INR and I have it in color Tropique Pomade. 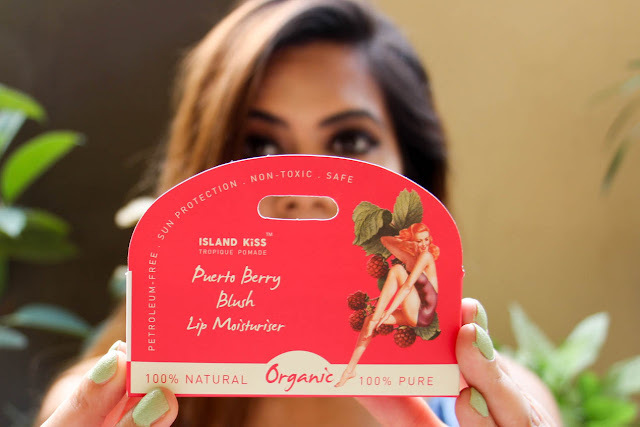 Island Kiss Puerto Berry Blush is a all natural, organic and pure lip blam. With all these clams, I was a little too pumped to try it but it is such an odd lip balm. It smells very weird, and if you lick it by chance, it tastes even weirder. The product has a little color and looks super glossy. I was expecting it to be super moisturising as its so glossy but its not moisturising at all. It slips and slides and is gone in 5 minutes. To make things worse, whatever little color it has gets stuck in lip cracks and looks super odd. 2. 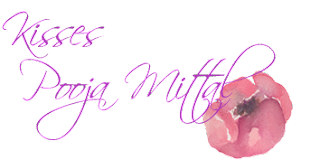 Its organic , cruelty free and not tested on animals. 1. It tastes so odd, like really odd. 3. Stays on lips for hardly 5 minutes. 4. Does not leave any stain. 5. Too glossy for me. 6. Does not heal dry chapped lips. 7. The color gets stuck to the lip cracks and looks super odd. Island Kiss Puerto Berry Blush is very glossy pink lip balm which does not moisturize at all and does not heel dry lips. 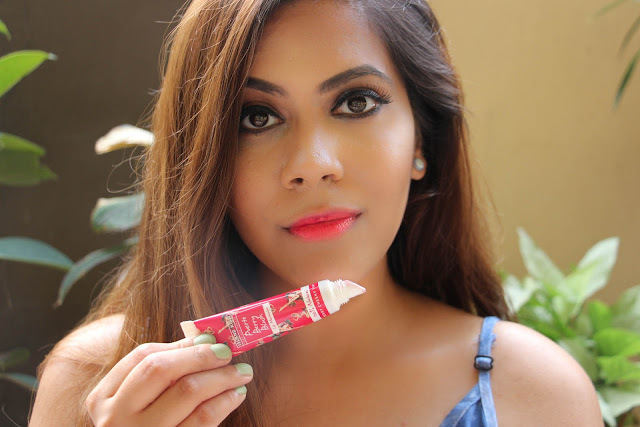 Its not a tinted lip balm in any way and I sure do not recommend it as a lip balm. But if you are looking for a all natural lip gloss you might like this, but don't forget it smells and tastes bad. Your website content is fabulous and awesome but I would like to say your website also good. Thanks for sharing... Keep it up.. The above recommendations can be gathered in subtle elements from #packers #movers #Chennai You can use to examine our site for the points of interest or subtle elements to be checked before contacting Movers and Packers Chennai.